Are you a first- or second-year student struggling with your papers? Busy writing your Bachelor’s thesis in the third year? A Master’s student writing your final thesis? 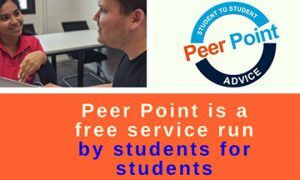 Peer Point is a free peer-to-peer service by the University Library. We will visit FASoS on Thursday 21 March from 12.00 – 14.00, don’t hesitate to come talk to us and find out more about how to improve your writing! Peer Point Maastricht offers advice on issues related to your paper and research (such as structure, referencing or databases, to name a few). Check out our opening times over Facebook, or send us an email to make an appointment! Do you need help with writing your paper or thesis?